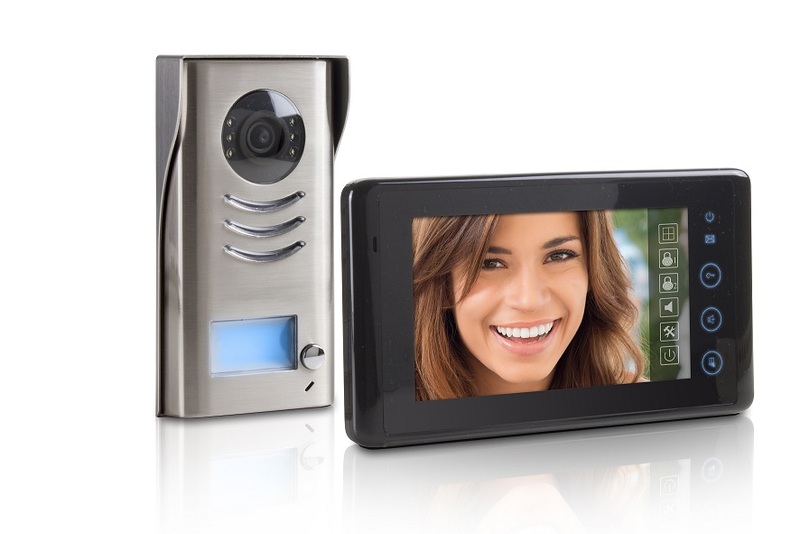 One-way video intercom kit based on 2 wires, not polarized technology. LCD-TFT monitor 7" sized, hands free with touch screen feature and soft touch buttons delivers good audio quality and very user friendly operation. The monitor and system programming can be done by intuitive OSD menu which allows also to program date and time, select call chime for door bell, external call and intercommunication among different tones and choose different volumes for the call ring during night and day. The external station is robust and compact, only 90mm wide: special care has been put on the design for a modern and nice appeal; it is suitable for surface mounting and the name plate is even blue back lighted. It can also drive up to 2 door locks (DC or AC). The system power supply is a DIN rail type. It is possible to install an additional monitor into the same apartment and the intercommunicating facility also available. Other accessories: wall bracket for monitor, sun shield for external station and fixing accessories.